God-willing this’ll be the last blog post on a lonely little folder of my PC. The website is going online soon! 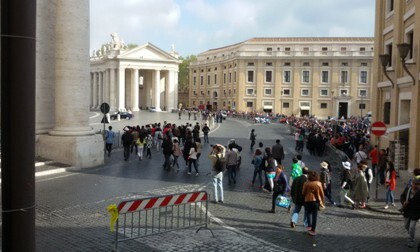 Yesterday I went to the General Audience in St. Peter’s Square with Pope Francis and a lot of people (see the photos). I had a special mission (something for my family) that has to stay top secret for now, but it had also been a while since I’d gone to a General Audience. One of the dangers of Rome is that you can take these things for granted. The audience takes a little longer than just reading it afterwards, but you don’t have the same visible experience of communion as the Holy Father teaches, and greets, and blesses in various languages and the participants respond enthusiastically. Due to time constraints I couldn’t adopt the optimal audience strategy: come early, get in line, and stake out a good spot for when the Popemobile passes by; I had to leave as soon as he was finished with the spoken part of the audience. Due to a slight train delay I arrived just after the audience started: the Gospel being meditated on is read to the crowds in the most representative languages of those attending. The Square was full, with a little space near the entrance. Pope Francis is a pope you have to see, if not in person, at least in video. By his smile and his presence you just feel a grandfatherly warmth as he speaks. At the end of the audience all those participating received his blessing, which he extended to our family members as well (so everyone in my family who reads this: you received a Papal blessing). This blog is still on a folder in my PC, but experiences do not wait for a website to go online. This morning I went to St. Peter’s to celebrate Mass for a small group coming from the South (and they were heading afterwards to a jambalaya cook-off in Austria–I kid you not). Another father from my Center also had a Mass there, or so he thought, and we headed there by car. Living in Rome is full of unique experiences; whenever you think you know the rhythm of things something new presents itself. 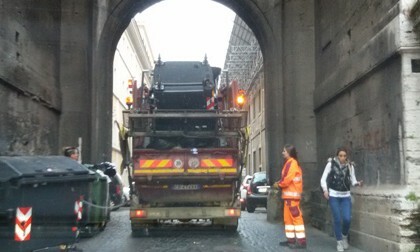 We turned onto a small street a few blocks away from St. Peter’s Square and ran into a garbage truck emptying dumpsters. 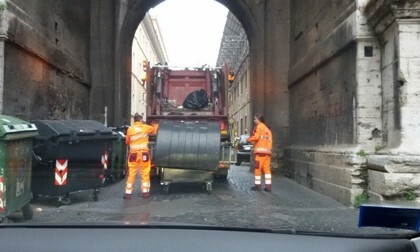 Since it was a narrow street, we had to wait as they wheeled four dumpsters, one by one, to the back of the truck, and then hooked them up to a mechanism to lift them up and empty them into the truck. It was fascinating. A motorino (moped rider) pulled up right behind one of the netturbini (sanitation worker) and she had to move out of the way to let him zip by (our car was small, but not small enough). Some tourists approached too on foot and hesitated briefly, probably out of fear of getting trash dumped on them, and then walked by. A few minutes later we were on our way and when we arrived at the Square it was closed. Completely. That doesn’t happen. I met up with the group outside the Square and we headed to the entrance into Vatican City that’s usually for going to Paul VI Hall for a Papal Audience. Once there we discovered that they were only letting in groups that had made a reservation down in the crypt beneath the Basilica. 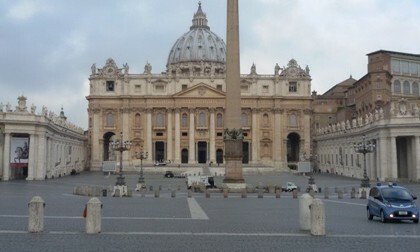 The President of Italy (Sergio Mattarella) was coming that morning to visit Pope Francis and the Basilica was closed. Fortunately my group had a reservation, but the other father wasn’t so fortunate: his reservation had never been confirmed. Combining groups wasn’t an option (he was celebrating for Spanish speakers), and he took it all in stride and went with his group to a nearby parish and they let him say Mass there. 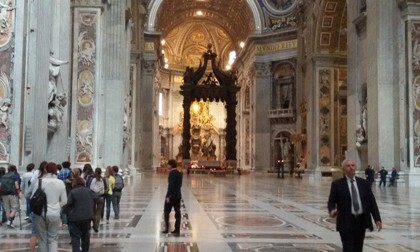 After passing two security checks they allowed us into the Basilica by a side entrance and it was amazing to see the Basilica so empty and everything cleared from the middle. It was the photo op of a lifetime. We made it down to the crypt for Mass only to find someone else had taken our chapel. Fortunately a nearby chapel was empty so we had a beautiful Mass. Afterwards there was no security pressure so the group stayed inside a while and took some great photos as I headed back to the Center. Wrinkles in our plans? Unexpected setbacks? Certainly. But nobody complained and everything worked out and in some ways even better that we could have imagined. This blog post is still on a lonely folder of my PC, but within a few weeks I hope to bring this blog online and there’s no reason to not start blogging now knowing the posts will appear online eventually. Over the last few weeks it’s been more of a “Roaming” Catholic experience. Yesterday I returned to Rome after spending Holy Week and the Easter Octave in Les Avants, Switzerland as chaplain for a group of chaperons and students visiting from Woodlands Academy, Ireland. 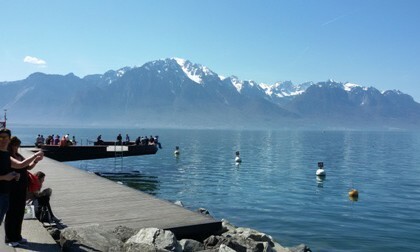 On my last day we headed down into Montreux so that I could catch the train to the Geneva Airport. I had one last opportunity to see Lake Geneva, surround by beautiful French and Swiss mountains before a quick lunch and off to th e train station. My time in Switzerland was restful and productive (this website being one of the productive things I worked on). My first impression back in the house was that we really went all out to decorate the center with flowers to celebrate the Resurrection of Our Lord. 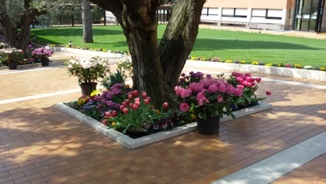 The driveway immediately in front of the entrance was lined with flowers in addition to the flowers planted in the gardens. 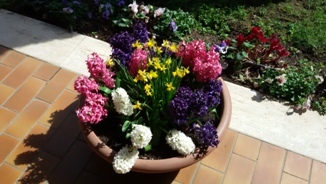 The bloom of spring had already begun in Rome; Switzerland was a little behind in terms of temperature, but not by much. Just another beautiful Easter reminder that spring shows us how something seemingly dead can veritably explode back to life. This post was made on a lonely little test folder on my PC, but the Solemnity of St. Joseph is the perfect day to write my first real blog post. 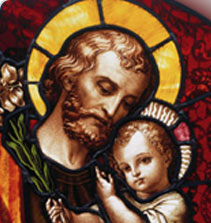 St. Joseph has helped me in practical matters throughout my life (especially the last financial hurdle to entering the seminary: the sale of my townhouse), and I know he will bless this blog that I am beginning on his feast day. 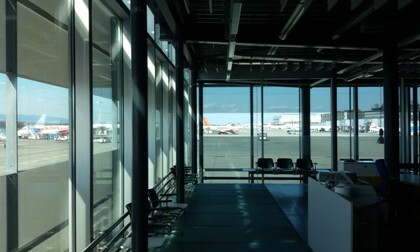 This blog, like this website, is a work under construction. I hope to build it little by little, blog by blog, in order to give back even a fraction of what I have received. I hope it helps us all to grow in holiness like St. Joseph.